Ever since I discovered how easy it is to make my own yogurt, we’ve been whipping up a batch about every other week. But because C has a dairy allergy, he has been unable to partake in this goodness – we’ve had to buy almond or coconut yogurt as an alternative. 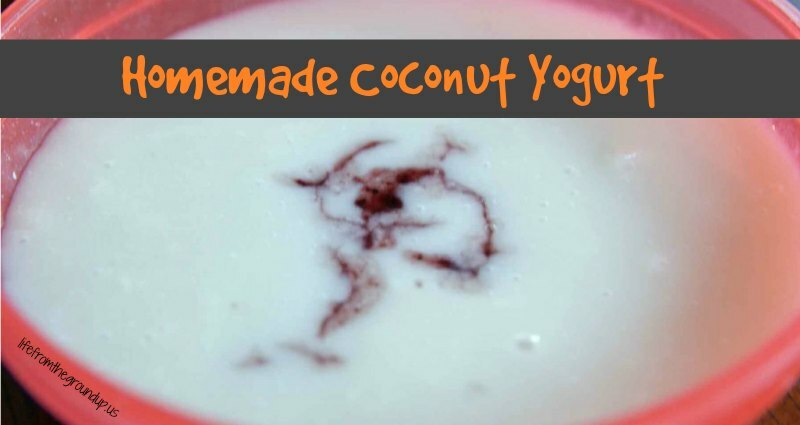 Unfortunately, coconut and almond yogurts are quite pricey, and because they don’t thicken naturally like regular milk, there is often a wide variety of stabilizers and thickening agents added, not all of which are exactly wholesome. Naturally, that meant it was only a matter of time until we created our own homemade coconut yogurt. The process is pretty much the same as a dairy yogurt, with a couple small modifications. I’ve actually made it two different ways (using different thickeners), and usually end up making a sort of hybrid of both. 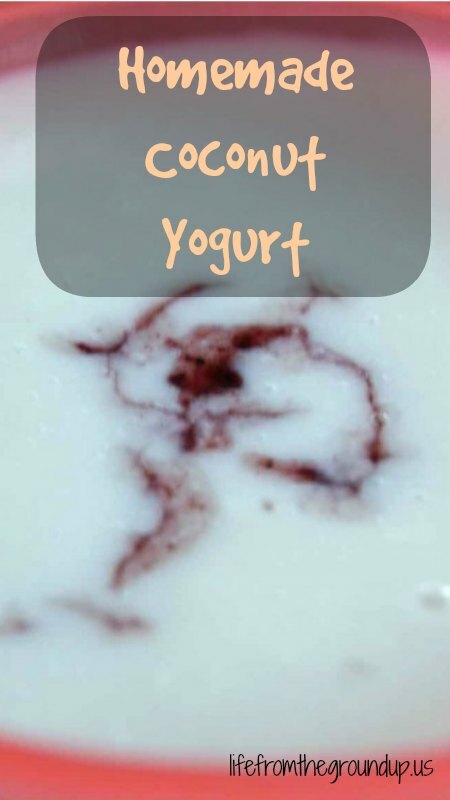 Arrowroot (which acts like cornstarch, but is non-GMO) yields a creamier texture; using gelatin will result in a jello-like consistency (meaning you’ll have to blend it up if you don’t want to eat it in chunks), but it also adds some bonus nutrients. The only process difference between these two is that you’ll add the arrowroot to cold milk, and gelatin after it gets hot. Go ahead and experiment to find your own favorite! And of course, use whatever non-dairy milk that you prefer: coconut, almond, rice, hemp, even your own homemade stuff (we personally try to avoid soy products, but I suppose soy milk would work as well). Add 2 cups coconut milk and maple syrup to a clean quart jar. Combine the remaining 2 cups milk and arrowroot in a small bowl, mixing thoroughly. Pour this into the jar with the rest of the milk. Fill a stockpot with about 2 quarts of water, put the jar in the water, and place over medium high heat. Simmer until the temperature of the milk reaches about 170-180 F (I make this with my regular yogurt, which requires this temperature; I honestly have no idea if the coconut milk also needs to be heated that much). Remove the jar from the water, and slowly stir in the gelatin until fully dissolved. Let the milk sit until it reaches approximately 110-115 F, then stir in the probiotic powder. Place the jar in a warm spot for 6-12 hours to incubate (I put the stockpot of hot water in a cooler, then put the jar in with it - works perfectly). Note: After the allotted time, the coconut yogurt will still be pretty runny (not thick like a dairy yogurt) - put it in the fridge for a few hours to thicken up.